In front of a poorly lit hotel in a padded lawn chair, I looked to the night sky. A sky lit up with distant, echoing light, collected and named by humans, and alive with constellations. The river Eridanus flowed to earth by way of the mountain in some celestial fashion that seemed a bit more epic than usual. It fed the wilderness below it, like a man taming a wolf by slowly and reassuredly placing food at its paws. Wolf and river both defiant and feral, yet obedient. Though the River Po and the Nile were half the world away, a great river raged before me. A river that seemed to savagely mock Eridanus with its wild and rebellious nature. The 5th largest river in the United States is by far the most tempestuous, and because of that, humans have done their best to subdue it. They bind and regulate it like a lonely man trapped in an asylum, enraged by his own doing, shackled. The stars created an ominous glow on the water, just enough to see its black reflection. Even more was the sound. 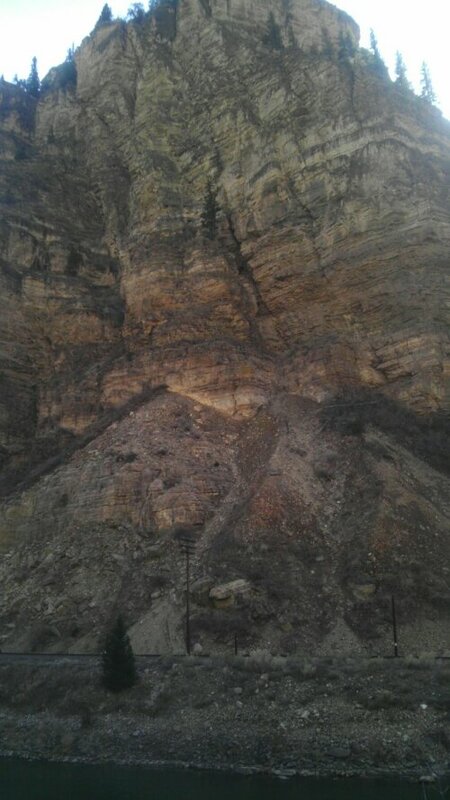 Throughout the canyon the river roared showing its discontent, asking to take notice. Upon the horizon, Orion began to raise his shield. With one foot planted within the headwaters of Eridanus, he waged a war that began with time itself and one that would wage on throughout. The slowest and most epic war of all. My mind wandered. Of all the constellations in the world, Orion has one thing others do not. The unknown. Within Orion there is a void, the largest in the known universe. So large, that it disproves many scientific theories about the universe enough that they had to create a new theory to once again prove their original theory. An unexplainable void. Absolute emptiness. 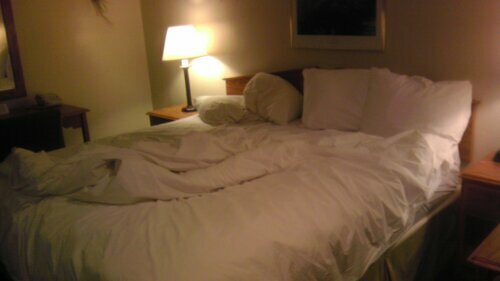 The one thing I enjoy the most about winter fishing is staying in a hotel. Coffee and hot breakfast in the morning sets you off on the right path for the day. Upon waking, I found neither available. I placed my key upon the desk and walked out in search of scrambled eggs and coffee. With no time to sit down to eat, a red bull and sausage biscuit would have to suffice. Sometimes gas station food hits the spot. 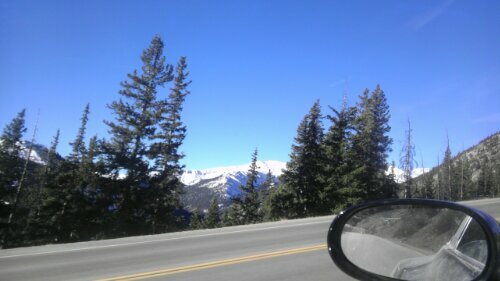 I scurried up the canyon in my car, singing. It’s a habit that I have done since I was a child, I would sing and ride my bike as fast as possible. The epitome of freedom. On a road devoid of traffic, I flew. The open windows let in the cold air while I attempted acclimation of the new brisk air now warmed by the sun. A smile forged itself across my face as I pulled into a parking lot. I tied my favorite streamer with my vise attached to my steering wheel as onlookers came and went, some asking questions, some just curious. 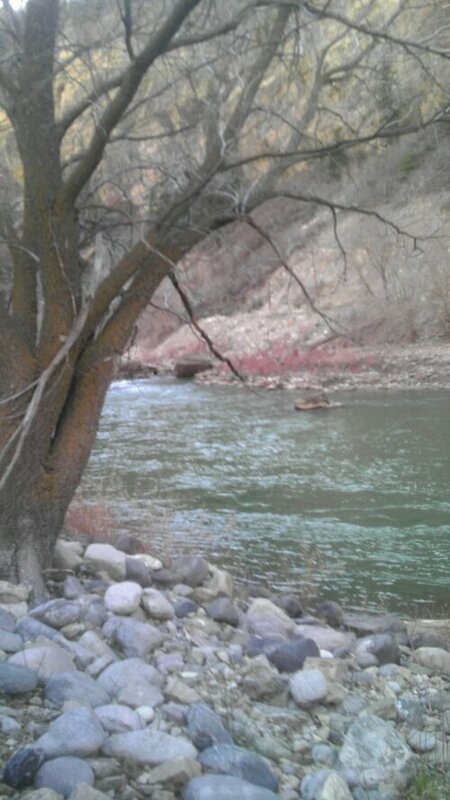 As I tied, I looked down the canyon at the river. It looked slightly peaceful from my view atop the hill. A view that would change as I made my way closer to the river. As the river drew nearer, the drone of the river’s roar became deafening. There was a moment that I wanted to turn back. I had gone too far over my head and the river didn’t want me there. 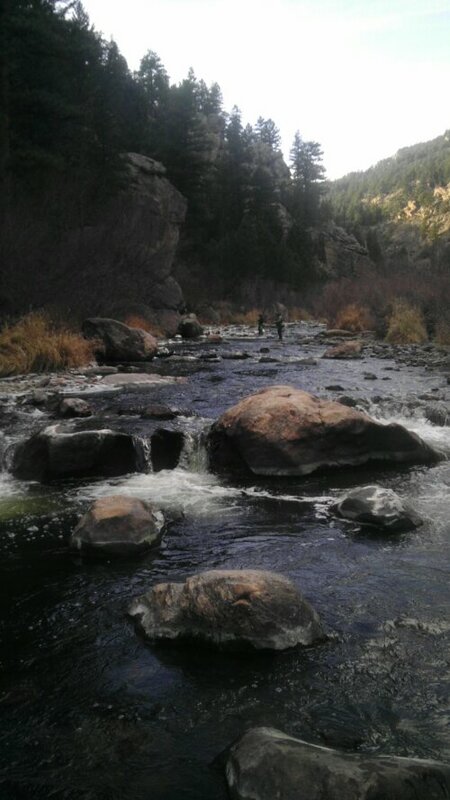 I have fished rivers like this, and really, this was just a larger version of another river that I love. I sat next to a slow pool and rigged up. The wind was enough to sail roll casts just beyond my normal reach. Fluid and accurate, the casts found their way into seams and pools. Every few casts a fish was expected, but none were found. With more time brought more of nothing. Four miles of river, four miles of desolation. Six hours and no bite, no tap, no fish. Eridanus is not commonly known for fertility, but it feeds fertility to the Po. This energy was used to harbor irrigation, farming, and fishing. Even plumbing and construction, it had magical powers only legend could explain. At the time, who would have known any better? The more science irrigated those fields, the less the Gods made sense. Slowly but surely, they died. The only evidence were these shaped stars in the night sky. Man’s grand scale of connect the dots. Even though the God’s were dead, the stories lived on through history as a way to navigate the night and to entertain children. Orion himself is used as a guidebook for the rest of his immortalized brethren. The sun began to drop behind the canyon walls, seemingly clinging to the peaks as he bid his daily farewell. I fished the seams now armed with only hope which clinged to the mountain tops of my mind, ready to fall dark at any given moment. I stopped at a familiar pool and cast into a deep current uninhabited by living creature. To my surprise, a fish found my streamer. A big fish. A fish as wild as the river itself. A fish with a strength that I have never felt before, and five feet before me laid the biggest Brown Trout I had ever seen in my life. “Chewie” hung from a mouth I could fit my closed fist into. After a well timed shake of the massive head, Chewie became dislodged and hung suspended as the fish moved on. I dropped to my knees. Maybe I sat and cried for a few, the details were fuzzy now that I try to recall them. All was quiet, and giving up now would leave me with a skunking I had never felt. 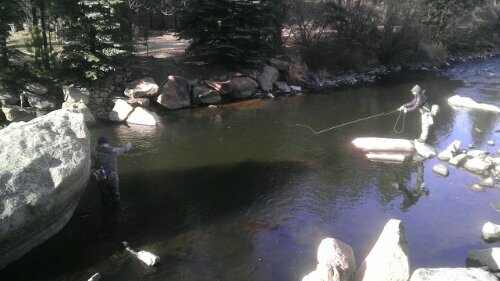 I cast again, fish. Still healthy and very strong for its size, a small brown found its way to my hand and the skunk hiding in the bushes waddled away. Depending upon the stories you have read, Orion is a hunter or warrior. In his left hand could be a shield, lion, or bow. His right, club or sword. Maybe when we stack the deck, that left hand could be a fish, and the right could be fly rod. Maybe he is just an ordinary man, like me, on a mission to enjoy life by fishing. Now that the sun was setting behind the earth, I laid out my last few casts. One last cast produced a final ultra-fat rainbow. I sat in awe and hope that one day I will return for my well deserved monster. As I sat on a rock enjoying the fulfillment of my day, I looked up at the sky and upon the top of the canyon was, Orion rising. Maybe after all, that unexplainable void was just a trick of the eye. There isn’t much I can say about fishing late fall. I’ve never been good at it due to my hatred of fishing eggs and worms. It feels like cheating. 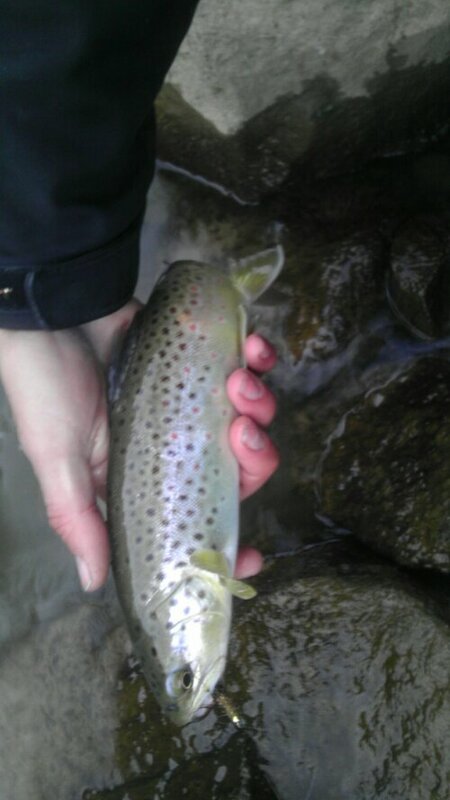 I stay away from spawning browns and stick to my rainbows. While others reap the rewards by dredging eggs in hopes of a monster and it happens from time to time. I can’t discriminate, the difficulty of catching fish with insects this time of year is astounding and its easy to tie on an egg and “rip lips” or “stick pigs” with “tight lines”. The night before was spent around a table eating chicken and drinking beer around warm conversation and a fire crackling in the background. One thing lead to another and the chicken became hand cranked popcorn and beer turned into eggnog. A simple life that now seems complex. The extra effort put forth from turning popcorn is now replaced by a microwave and a tv. I saw neither in this house and judging by the towering expanse of wood split by hand, there never will be. Things were mentioned about tying flies and Jay showed me some Banjo (the dog) dubbing contained in three, one-gallon bags. Without skipping a beat he mentioned that he likes to comb the dog. A lot was learned about the semi-new face that I would be fishing with the next day. I thought my life had taken me places until I began to hear the stories from Jay, instigated by Erin, who sat in her rocking chair gripping her mug of nog. We spoke of the past, reminiscing about things that sparked laughter at times and a tip of the hat to others. They had made me feel welcome and it nearly felt like I had slipped back in time. We had lived already, and we were about to live some more, the best way we knew how. By fishing. I haven’t been enough of a nerd lately. This post should even the balance. I mentioned in the preceeding post that I would show you all a halo midge pattern. Well, I felt there was a lot to explain about my tying mentality and how and why I am non-traditional and sometimes non-conventional when I sit behind a vice. The next bunch of posts are tips and tricks on how to trick a picky fish. If you haven’t heard, red is important to you as well. I’m about to automatically dismiss my steelhead catching ability. 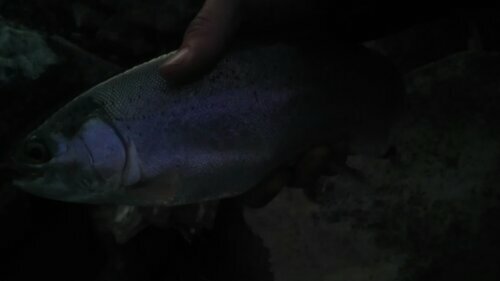 I HAVE NEVER ATTEMPTED TO OR HAVE ACTUALLY CAUGHT A STEELHEAD. With that being said, I am still a nerd and nerds are great for one thing. Facts. In my fly tying, there are a couple simple rules that I follow. One of those has to do with triggers. You can perfectly “match the hatch” as much as you would like and still be a very successful fisherman. Then will come the day where you ask yourself, “why did that fish slowly and deliberately eat my indicator?” The answer lies in what triggered that fish to strike. There is no indicator I know that remotely resembles an insect. (More on why and where I use indicators later, and while I am on the subject, there will be more on how fish brains work too) Something about your indicator triggered that fish to strike. One of those triggers is color. In humans, red is not our favorite color. In fact, it is only favorited by approximately 9% of people. There is a perfectly good explanation for this. The color red quickens respiration and the speed to which we react to things. As complex and misunderstood as the human brain, simple instinctual reactions to simple mechanisms generally span across lines of species. In other words, fish react in a similar manner. Even a fish brain, more specifically a trout brain, is 70% dedicated to visual response. This enhances their reaction to visual stimuli. Have you ever tossed a red San Juan worm to a pressured fish hanging out in the shallows? They react to it. You may see them line up for it, but they might turn it down as it gets closer. Distance and light distortion play a huge factor here. They may have wanted it when it was more colorless, but as it gets closer, they see its true color. Water acts as a filter. This is due to the harmonics of the hydrogen bond and complex physics that require a bit more than you want to read, if that hasn’t happened already. So, at a distance across water, red looks more like gray. At a depth of about 6-10 feet in rough water you will lose the color red completely, even if it is at a distance of 6-10 feet from the fish in shallow water. The angle of the sun in relation to the surface of the water plays a massive role in what light penetrates as well. What does this all mean? 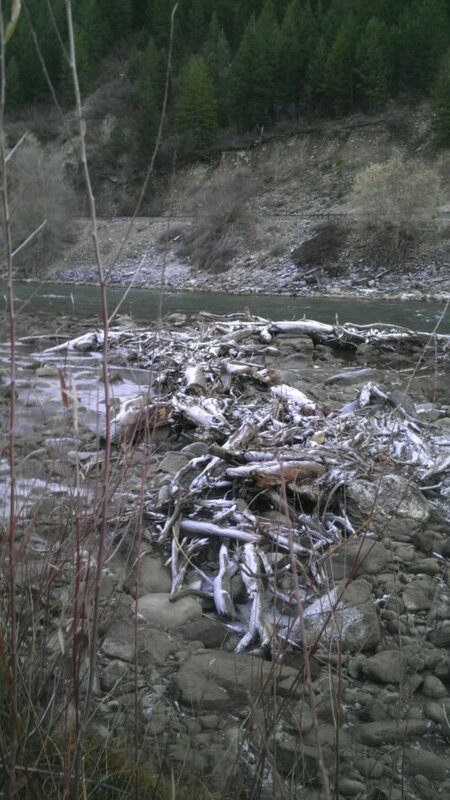 This is where my steelhead buddies should pay attention… Don’t use reds in deep water. More so, those deep choppy runs. 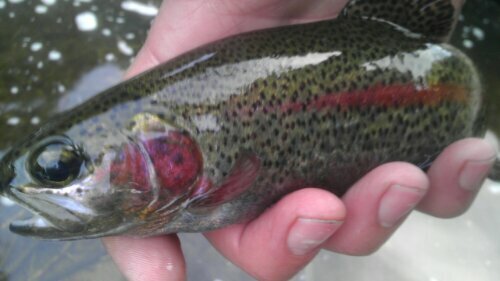 For us trout people, it means that if you can’t see that red bug, chances are it has turned gray. If you find yourself successful with red, use this info wisely. Fly tying is like a combination lock rather than a hatch matching marathon. Next time you fish, start deconstructing a working pattern to find what is triggering a strike and use similar bugs of different colors and sizes. This is how we progress the art and come up with amazing working patterns. I’ll be talking about phosphors and generated photons soon as well as reflected light underwater in my next nerd fit.